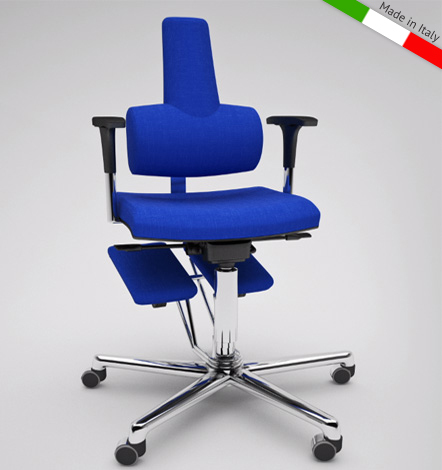 The Komfort Cushion was born after orthopedic and physiotherapy studies to satisfy the request of an orthopedic cushion for chairs and seats. Therapeutic Properties: Komfort Cushion is a therapeutic device because it is able to cure and reduce existing back pain limiting the muscolar activity and restoring the normal spinal curves. By combining the use of this posture corrector device with the treatment from an expert clinician it is definitely possible to heal many kind of back painS, reduce muscle fatigue and help fluxes from the nervous, lymphatic and cardiac systems. Preventive Properties: Used daily, the Komfort Cushion prevents fatigue of lumbar muscles and the development of low-back pain. In addition, as it maintains the proper spine alignment, it also educates the body to keep a correct posture even when standing or walking. The vertical section of Komfort Cushion is made of a viscoelastic mixture with memory properties, able to adapt to any surface; the horizontal section is composed of a hypoallergenic microcellular foam. This makes the Komfort Cushion very resistant and it preserves its orthopedic properties over the years. 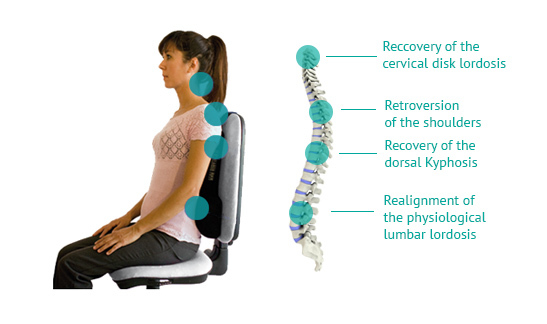 Buy today Komfort Cushion and find out all the benefits of a good and healthy posture.